“The Fullertons, Fullartons, Fowlertouns, etc. are perhaps fortunate to have at least a ‘rumoured history’ which pre-dates the 12th Century. As has been shown, our crest is adorned by a camels head. Why should this be so when there are no camels native to Scotland? There is a story to explain the camel. It has been said that those who were later to call themselves Fowlertoun were descended from Phoenician mariners who were shipwrecked on the northern coast of Europe, possibly where Norway now lies. They joined up with the tribes sweeping south into Gaul or what is now France and eventually aligned themselves with William the Conqueror and joined in the invasion of Great Britain. Because they were for some time in Gaul it has therefore been said that their origin was French. In 1086, having conquered most of Britain, William I ordered the Great Domesday Survey which is the forerunner of our modern census. Prior to that time surnames were not in use by English speaking people. Only given names were used thus making the tracing of ancestors prior to that period virtually impossible in all but the most noted or titled families. Generally the given name was used exclusively. A man, Evan, may have called his son “Evan’s son” which was eventually simply “Evanson”. To the Scotch, “Mac” meant “son of”, and this Macdonald was “The son of Donald”. For the Great Domesday Survey, the forerunner of our present day census, surnames were required and so were taken. Some were related to occupation, such as Baker, or Fuller. Some took names from a favourite or ‘nick’ name and others from the name of a place where they lived or were born. Because the great majority of the people could not read or write, these names were passed by word of mouth and when written down were often misspelled or changed. Perhaps some Fullers who were cloth workers (one who ‘fulls’ cloth), did take the name Fullerton, either because of mistranslation of ‘Fullers son’ or because a person from ‘Fullers town’ shortened the name to Fullerton. Another origin of the name may be a composite of the words ‘Fuller’ (one who whitens anything) and ‘tun’ (house or home). This is pure conjecture, however, and other origins of the name Fullerton seem better substantiated. Some by the name of Foulertoun, Fullarton, or Fullerton undoubtedly stayed in England, but there were a group who are said to have gone to Scotland as adherents and followeres of Walter, son of Alan, ancestor of the High Stuarts (Stewarts). These are said to have left England, around Shropshire, early in the 12th Century, to settle at the court of David in the North. Walter received grants for himself and his followers from the Crown. These lands were located in the counties of Ayr and Renfrew (now Renfrewshire), and Kyle (later Kyle-Stewart), and Strathgryfe. Fullartons (probably using the older name ‘Foulertoun’) were in Ayrshire and in possession of a barony of that name near the town of Irvine, early in the 12th Century. The Fullartons of Kyle-Stewart were said to be of Anglo-Saxon or Norman origin. That part of the Barony of Fullarton, whence the designation of the family derived and probably also their surname, is near the town of Irvine and in the Balliwick of Kyle-Stewart, near the mouth of the Irvine River, which location, it is noted, is an excellent spot for fowlers. The original castle of this group was located near the mouth of the Irvine River and they were said to be hereditary fowlers and falconers whose duty it was to procure and provide fowl for the table of the royalty and to keep and train falcons for hunting purposes. From Kyle Stewart the Fullartons spread to the Island of Arran and, at one time, through various grants, Fullartons owned all the lands south of the Irvine River to the shore and south to about Prestwick. 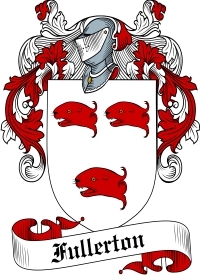 These lands included: Fullarton (part of Irvine) Troon and Corsbie (same as Crosvie); Dundonald; Dreghorn; Shewalton (from whence came the Boyd family which family was related to the Fullartons through several marriages). The rights to Fullarton and Troon included fishing rights in the river and sea and Lady Isle. The foregoing is quite consistent with other views on the origin of the surname. Other sources refer to the name being derived from the Old English (pre 7th Century) “fuglere” (a bird catcher, the word fowler was derived from this word) and “tun” (an enclosure or settlement) thus “the settlement of the birdcatchers”. “The story begins with an ending. In March 1603, the same month that James VI of Scotland began James I of England and Ireland, the earls of Tyrone and Tyrconnell, chiefs of the O’Neills and the O’Donnells, the leading families of the ancient province of Ulster, surrender to the English. Thus concluded the Nine Years War, the latest in a long line of struggles to arrest the steady expansion of English power in Ireland. It was in Ulster that Celtic Ireland had made its last stand against a foreign invader, all the more unwelcome because he now came garbed in a cloak of militant Protestantism, a direct challenge to an ancient Catholic tradition. It had been a particularly bitter struggle, and Ulster had been devastated. The northeastern counties of Antrim and Down, within sight of the coast of Scotland, are described by contemporary writers as ‘all waste’. For James the conclusion of the Nine Years War came as a welcome addition to his new glories; it also presented him with a problem and an opportunity. As a man and a king he was no more sympathetic to Gaelic traditions and culture than his Tudor predecessors on the English throne. While still King of Scots he had been preoccupied with the problems posed by his own minorities in the Highlands and Islands, whom he once described as ‘utterly barbarous.’ In the 1590s he had even sponsored a scheme of internal colonisation or plantation, handing over the island of Lewis to a party of Lowland adventurers. These men were to bring civilisation and commerce to the western Isles, in a project that allowed for the wholesale extermination of the local Gaelic clans. Faced with the widespread hostility of the Highland communities, the Lewis plantation was a costly failure: the idea, however, remained fixed in the royal mind. Taking the lead of Montgomery and Hamilton, land hungry Scots crossed the North Channel in ever increasing numbers. What they found would have daunted all but the hardiest spirits: ‘…parishes were now more wasted than America (when the Spanish landed there)…for in all those three parishes [Glenabbey, Donaghadee and Newtonards] thirty cabins could not be found, nor any stone walls, but ruined roofless churches, and a few vaults at Grey Abbey, and a stump of an old castle in Newton, in each of which some gentlemen sheltered themselves at their first coming over.’ But the land was good and largely unfarmed, as the native Irish economy had been pastoral rather than arable. Settlers were also encouraged by the promise of long leases, far better than the unfavourable terms in their native Scotland, where short leases acted as a disincentive to good husbandry and improvements. Plantation, the Scots were soon to show, could be made to work, especially when it was supported by adequate military force. A second and more significant opportunity came in September 1607. Although Hugh O’Neil, Earl of Tyrone, and Hugh O’Donnell, Earl of Tyrconnel, had made their peace with the government some years before, they had been subject to almost continual harassment by the Dublin authorities. Fearing for their safety, the two chiefs left for the continent, never to return, an episode famous in Irish history as ‘The Flight of the Earls.’ James now had huge territories in central and western Ulster: Hamilton and Montgomery’s free enterprise scheme was supplemented by the Plantation of Ulster. Land was granted to men known as ‘undertakers’, who pledged themselves to bring over settlers from England and Scotland; only the more inferior lands were to be allotted to the native Irish. This time more English settlers began to make an appearance, though they continued to be numerically weaker than their Scottish cousins. This is hardly surprising: England was richer and far more settled than Scotland, and Ireland remained a dangerous frontier. Native Irish chieftains, deeply resentful of their changing circumstances, took to the wilds as outlaws, and as ‘woodkernes’ represented a real threat to the more isolated settlers, many of whom were wiped out in midnight raids. The descendants of the Scots migrants were later to face a similar threat on the American frontier. While the Irish raiders were tough, the Scots were even tougher. Many of the early migrants came from the Scottish borders, men with names like Armstrong, Bell and Elliot, where they had been hardened in an age-old struggle with the English. Source: The Fullertons of North America, Gordon W. Fullerton Jnr.